Earlier this summer, a friend of mine told me that she and her husband had lost their dog to illness. This pet had been a part of their family for so many years and having him suddenly gone continues to be very difficult for them. One of the The hardest things about living with loss is that life continues all around us, and we are expected to move on as well. Even though our hearts ache, the sun continues to rise each day. Our family lost our dog, Grover, about a year and a half ago. We’d had him for eleven years and he was very much a part of our family. While I knew that he would leave us oneday, I just never thought about “when” that day would come because I knew it would be hard to say goodbye. But even knowing that, I would never have changed my mind about adopting Grover. He brought so much to our family and we’d have missed all that. Still, there are moments when I tear up just thinking about him. He was a big gentle dog with brown eyes that had a way of melting my heart. I know that my friend’s dog meant the same, or more, to her. I am reminded of a clip I saw of Jimmy Stewart, the actor. He was on the Johhny Carson show in 1981 and he read a poem about his dog. It’s a beautiful tribute to a dear friend. 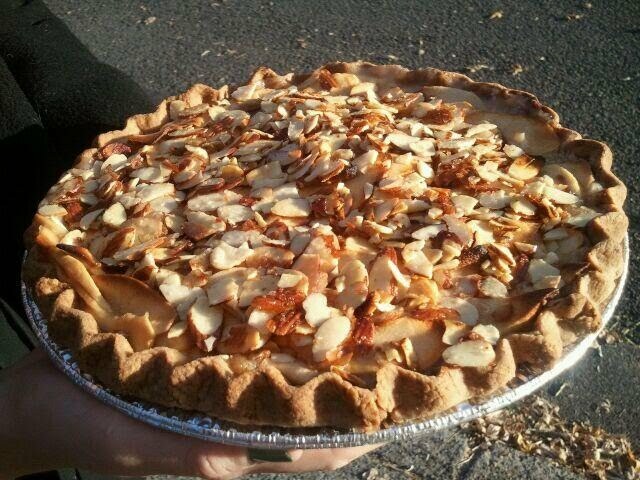 Today, I baked a “Kickass Apple Pie” and topped it with sugared almonds to give to my friends to let them know that I share their loss and wish them both well.